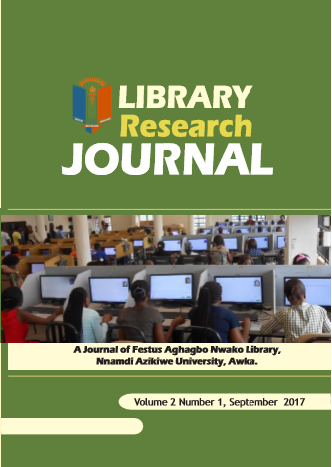 Library Research Journal is an annual publication of Festus Aghagbo Nwako Library, Nnamdi Azikiwe University, Awka Anambra State. 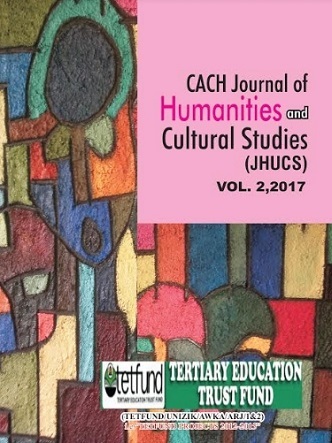 The CACH Journal of Humanities and Cultural Studies is an internationally peer-reviewed journal published by the Centre for Arts, Culture and the Humanities at Nnamdi Azikiwe University, Awka. JHUCS scope of interest includes the provision of a platform for interdisciplinary research and debate in the Arts, Humanities and Cultural Studies. The Journal also encourages articles that deal with the theory and practice of culture, the reception and creation of texts, and the ways in which Igbo and African culture facilitate cultural identity. UJOLIS is the Journal of the Department of Library and Information Science, Faculty of Education, Nnamdi Azikiwe University, Awka Anambra State, Nigeria. The journal has scholars who are knowledgeable in research on the Editorial Board and is published twice a year. The intending authors can submit articles anytime of the year as call for articles is continuous. Following acceptance of an article, it will be published in the next available issue in both print and online versions.